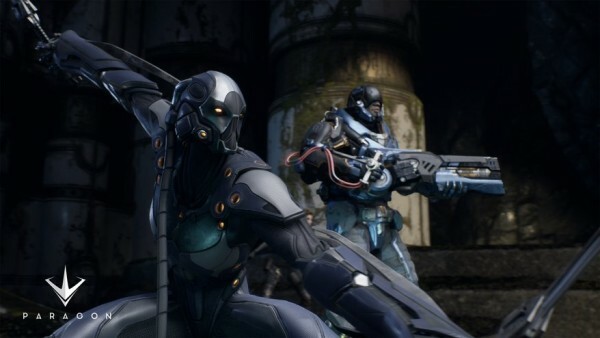 I was lucky enough to get in to the Beta test phase of Paragon from EPIC studios. The game is very ambitious Multiplayer online battle arena (MOBA) game that is challenging many of the traditional MOBA elements, while still keeping to the genres roots. The first thing that anyone who plays this game is going to notice is how pretty it it. The game is rendered in Unreal engine 4, and everything looks amazing. Colors pop, champions animations are fluid and beautiful, and the map is alive with terrain that is anything but flat. The second thing you are likely to notice is that this is an over the shoulder Third person style of game. Instead of League or DOTA’s top down perspective you get a single over the shoulder camera. Fans of Smite will be familiar with this perspective, and it serves well in Paragon, giving the game a more epic feel. One of the first things I noticed about the games perspective is that it makes ganking and surprising your enemy much easier. Its too easy to zero in on an ememy in front of you and forget to check left and right and even behind to make sure you arent goign to get ganked. This combined with the extreme variety of terrain made the game really refreshing. 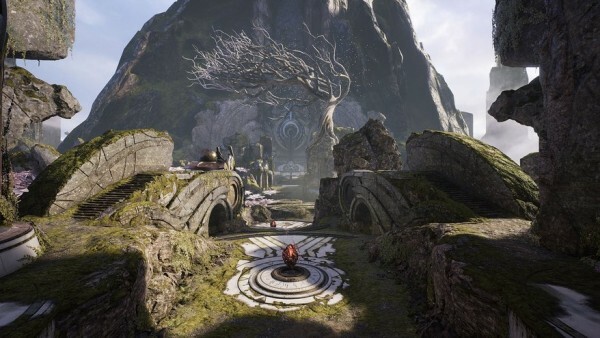 Paragon is also working on a fresh take of items and levels. 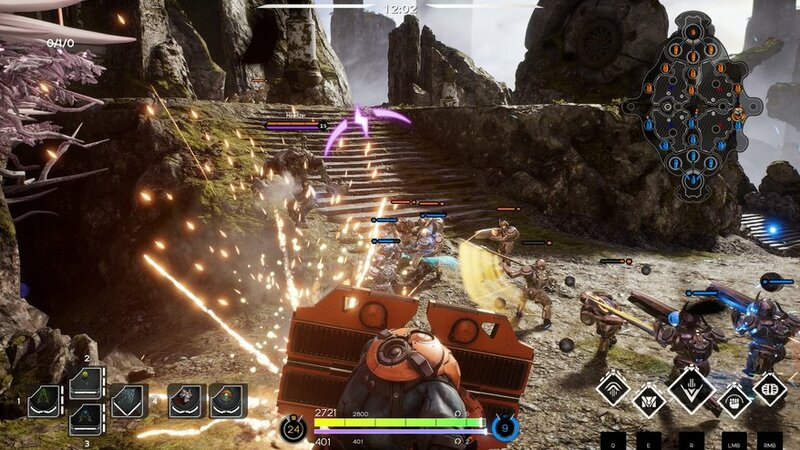 Most MOBA games have items and levels and talents, Paragon sets out to break this mold with its card system. It still has leveling, but EXP is not passively instead it drops from mobs that you kill. Each enemy or mob kill drops drops amber colored orbs which you pick up to earn CP(card points) and EXP. Last hitting is still very important, as the amber that drops from minions will be summoned to you (With a very fluid pretty animation) if you are the one to last hit the minions. You also get more EXP and CP from last hitting then you do from just killing minions. Card Points or CP are the currency of the game, and experience is how you level the games abilities. Paragon does not have items as you might traditionally think of a MOBA having, instead you make a deck of cards, consisting of three types of card. First you pick a primary strain card, this is like your passive and you always start with this card. Next you pick several active cards that you can buy and equip like items, these are bought with card points and some are passive stats and others are active abilities, most right now are pure stats but the game is still in its infancy with many more cards to come. A few exmples of active cards are potions (Which the game handles on a charge system 3 uses before refresh) and wards. The final card type is upgrade cards and these slot in to existing equipment cards (think of how MMOs let you slot weapons) to give the equipment card more stats. most equipment cards have three upgrade slots and its in these upgrades that you really get in to a champions build. I may chose to equip a card that has damage, but slot that card with some health to help me survive dishing that damage out, or perhaps armor pen to get that damage past a powerfull enemies defenses. All of the item cards that I have seen have three upgrade slots, and once you finish upgrading the card you receive an additional upgrade bonus. This system keeps the game adaptable and intresting, because while most items cost 3CP some upgrades and deployables cost as little as 1. Card points are awarded fairly frequently, but they max around 40 so keeping in mind what you are building is a good idea. Each time you use a card it is “consumed” and you can not use it again during that match, so keep that in mind when building decks. see all of that on the left? those are cards that this STEEL has in their build right now. Unfortunately this is a bit of double edged sword. Building wrong means your game is over, period. If you take a deck for crit chance for example and you end up against a team who is mobile with a lot of armor your going to have a really bad time. I found that since decks are limited to 40 cards you can really only build for one thing, with a tiny flavor of something else. For example I might build a crit chance deck, and mix in some armor and life, so that I can survive long enough to deliver that damage. Since cards are consumed on use, when building decks you need to make sure that you have enough diverse cards to slot all of your items to full and get their bonuses. The playable roster for Paragon is currently quite small, but has a good variety of types of champions. Assasins, Rangers, Casters, Tanks, and fighters all currently exist in game and no two heroes really feel the same. A lot of this is due to the fact that there are basically 5 attacks per hero and none of them feel bland or the same. Some champions are melee, other are ranged, and some are able to mix the two together. Champions still have an “ultimate” and basic attack, but the difference is there is no auto attack. Instead you will be manually firing or slicing at your enemies, all be it with a basic attack that consumes no manna. As far as I can tell, most of the champions I have played have one buff and 4 active abilities. I like the mix of combat so far, and its pretty clear that traditional MOBA roles are here. During the games that I played my team split off in to our lanes, just as anyone would, and our jungler took off in to the jungle. The jungle in this game is absolutely bonkers, its a maze of passages through the center of the map that spreads out and is surrounded on both sides by high canyon walls. What a cool feature this is, its one of my favorite things in the whole game. The map is just so pretty, everything is moving, or alive, or shiny. Its one of the best examples I have seen of the current gen unreal engine put to effect. I found myself pretty immersed in the game no matter what i was looking at.